It is place with great heritage and rich legacy … the holy Thiruvallikkeni (Triplicane as crudely rolled and twisted out of shape by the English tongue) - a place where religion, nationalistic fervour, patriotism, sports, education and the individual dignity have interspersed for the benefit of the State and the larger interests of the Nation. This place in singara has produced many eminent Lawyers, great Doctors, Teachers and more importantly very responsible citizens. ………. in this famed land, as you walk on the road, you might brush with very ordinary looking people, whom you may not cast your look for a second time…..but looks are deceptive – they could well be a great learned person contributing immensely to the Society …. I have recently posted about some of the ‘Jewels of Triplicane’ (Vai Mu Kothai Nayaki, Dr VV Ramanujam, Kalaimamani GP Kamala, Kalaimamani Dwaram Mangathayaramma) … here is one more to the big list [intend writing more] …. Here is a person bent on eradicating illiteracy. He looks very simple and many of us would have seen him in the four streets around the temple, little realizing his greatness and his services. He may look like a very simple next door neighbour, I found him to be waxing eloquence and a true karmayogi. This is a small tribute to such unsung people. Education is the most important thing in life – it will give Worldly pleasures and give pleasure to the world too; it will not diminish by giving; it will spread the fame of those possessing it; cannot be destroyed… there is no better medicine than Education that can cure all ills. At SYMA, we realize that Education can refine a person and ensure one’s success in life. We at SYMA, feel strongly the primary responsibility of improving the Society and helping the underprivileged. Our journey in right earnest began on 6th July 2008 and on a very auspicious day – SYMA Growth was born. 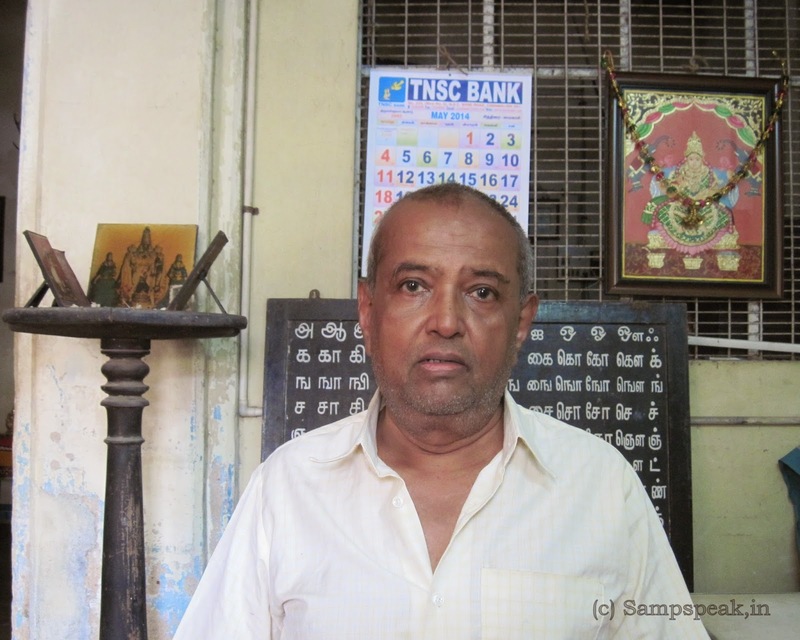 Here is a person associated with SYMA too – a person, who has outdone what an Organisation could to – it is Ramanujapuram Ananthanpillai Sriraj, popular as “Sriraj” ... 1947 - the year in which our Independence dawned, this humble person was born at a small obscure hamlet near the gold mines of kolar in Karnataka. Tamilnadu was to reap the benefits much later. This man had his schooling in the famous Hindu High school of Triplicane; did his graduation (Bsc Physics) and qualified himself with AMIE – Mech. As all young aspirants would do, joined Bhilai Steel Plant – a veritable industrial establishment in those days; subsequently turned towards business – their own establishment dealing with printing machineries. The story would have been a simple one on predictable lines – rise to wealth. This feature is on normal people, in society’s higher echelons but for the gritty some who fight with tenacity towards eradication of the social evils. This man took up on illiteracy. Chennai though considered the wisdom capital of the Bharat has clusters of slums inhabited by people with little access to education. The geography of Triplicane is too well known – all of us know the existence of slums and the standard of living of those inside; many may be blissfully ignorant of their trials and tribulations. Not for Sriraj. The urge to serve the weaker lings was always burning within. Here was a man motivated by Dr Hedgewar’s policy of educating and motivating the society. He made a humble beginning by teaching primary school children of Hanumanthapuram in the evenings., for moulding should start when very young. As the numbers swelled, he had to look out for a bigger place. He did not look outside for solution but shifted the tuition centre to his own house. For more than 15 years this noble person continued rendering service in style. At peak, he had more than 100 students with nearly 18 volunteers teaching the school curriculam. He was keen that along with education was imparted ethics, good conduct and more than anything else the cultural heritage of this wondrous motherland. He organized school books and guides also for the group which by choice was from the economically poor slum children. Many of his wards graduated (literally yes – completed B Com & et al) with a couple even completing post graduation. At a particular stage, he even made them Computer-literates too, by having 4 systems properly manned, teaching them the soft-skills. Sriraj the initial mindblock for those children was learning English but was quick to add that for any one with keen sense of hearing, memory, retention and more importantly the interest and attitude, learning will seldom be a far cry. He rightly points out that the present day English learning is after all something which dawned on this country not more than 160 years ago or a little more. His mantra for success is methodology, organized way of doing things, regularity in doing them, sincerity coupled with hardwork. He has practised his preaching that to overcome the social divide teach other and help in up-liftment. If only we had more like this unassuming person, perhaps one day illiteracy can indeed be eradicated. SYMA (and I) salute his indomitable spirit. With great regards to him – S. Sampathkumar. It is a story of a person who can look at the society with compassion, a real SRI VAISHNAVA indeed.